Just the right touch for a coffee table or small dining room table. 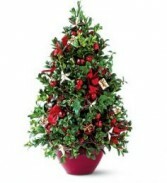 Cut fresh boxwood is designed to form this long lasting Holiday arrangement. Perfect for someone with a small area that needs a bit of Christmas Magic. One of our best sellers. A beautiful fresh centerpiece, filled with fresh Holiday greens and blooms. 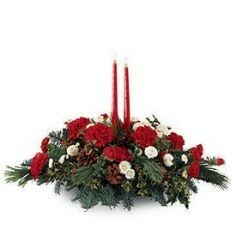 It's topped off with three red taper candles.